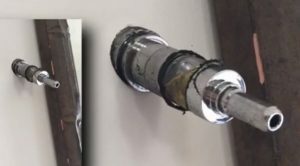 A Wichita man claims he is lucky to be alive after a mechanical mod blew up in his hand, causing minor burns and piercing the walls of his home. Jonathan Reser says his girlfriend wanted him to quit smoking, especially for the well-being of their young son, so he went and bought himself an e-cigarette from a store in downtown Wichita. 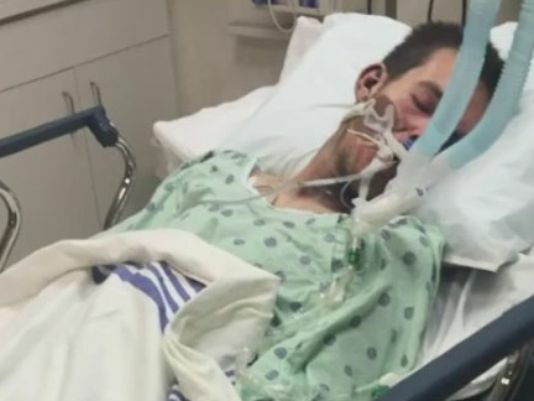 He paid $112 for a mechanical mod, and claims he followed the manufacturer’s guidelines when using it, but something definitely went wrong, since it ended up exploding in his hand. Reser says he had just taken the battery off the charger and placed it in the mod, when he started hearing a sizzling sound from within the device. He claims he hadn’t even pushed the button to activate the battery when it went off with a bang, puncturing holes in opposing walls of his home and scattering pieces of metal and plastic all over the place. 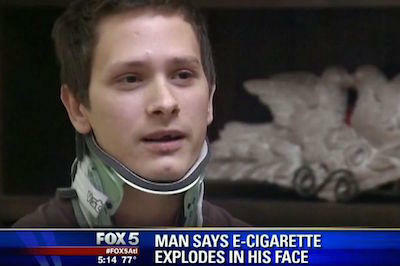 happy to be alive after the incident, John Reser went back to the store where he had bought the mech mod from and told KAKE News that the store’s staff pointed to a sign that read “e-cigarettes can explode” and told him he needed to buy a computer chip to keep the battery from exploding. Reser says the store did not offer to sell him the chip when he first purchased the device. “They say it’s safe indoors, but apparently it’s not, because it blew up and it could have done horrible damage. It could have hurt John, it could have killed our son,” Reser’s girlfriend Briana, said. 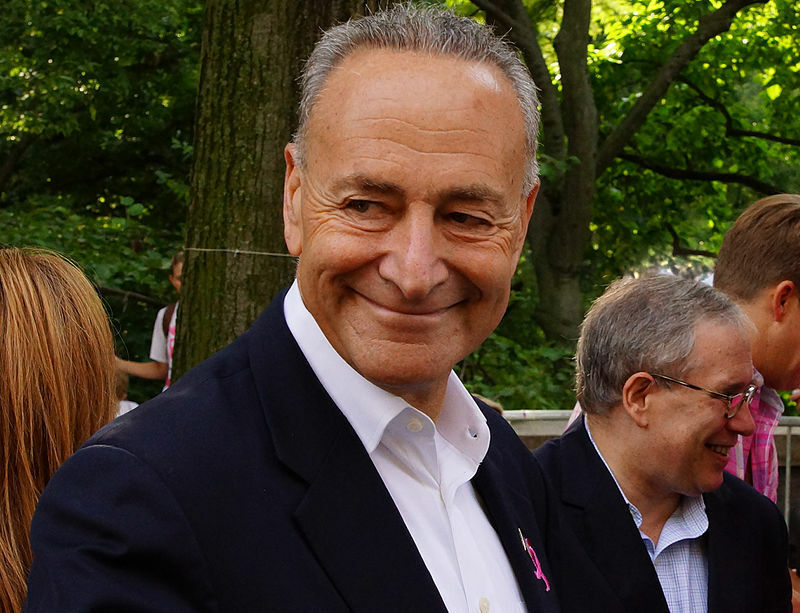 “I just want to let people know that these things aren’t safe”. Yes, all those horrible things could have happened, but not because e-cigarettes and mods aren’t safe, but because her boyfriend didn’t know how to handle it properly. And I’m not even sure it was his fault. After all, who in their right mind sells a mechanical mod to a beginner trying to quit smoking? Those things require considerable knowledge to operate safely – and even then they still pose a greater risk than a regulated mod – but this guy doesn’t seem to know much about vaping at all. Someone probably thought they were making a good profit on a $112 mech mod, without even thinking about the safety of the user, not to mention the repercussions such an incident might have on vaping in general. As e-cig shop owner Spike Babaian says education of the customers is probably the most important thing, to make sure the customer understands what they could do wrong to make the products dangerous”. Recommending he use a “Kick” computer chip with a mech mod as a safety precaution is definitely not what I would call educating a beginner vaper. Still, judging by Reser’s knowledge and experience with e-cigarettes, I’m inclined to pin this disturbing incident on human error. Sure, he says he followed the manufacturer’s guidelines, but I have yet to see a mech mod that comes with detailed instructions and safety pointers. Unlike e-cigarette starter kits, these things usually just come as bare-bone devices, without s much as an instructions manual. I wonder what kind of battery he used with the mech mod, too. Was it recommended by the store where he bought it from, did he buy it himself? There are a lot of things we don’t know, but one thing is for certain, this guy had no business using a mechanical mod.